With the help of Dragomir, modeling his Indoril Ordinator's, starting with the Order of War. Damn that looks nice. Are we going to be able to wear armor over other clothing or has that not been implemented? Because personally, I think I favor a more darker color under the armor, though maybe I'm just being too conservative to the original. It will be closer to the original as previously mentioned the current materials/colors are placeholders. Love it! Can't wait to see it in the game! Tussling of hawk and refinement of mask done. Why Akaviri? It's not like masks are a particularly Asian thing, and Dunmer have some Asian inspirations on their own anyway. scrup are u gonna hi poly these all 1st and then low poly? I'm guessing thats the more efficient method. I keep changing my mind, I guess highpoly first, baking them all at once might help with keeping them consistent. 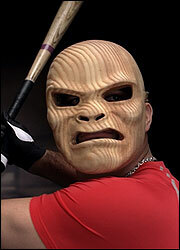 Reminds me of this mask. Akaviri stuff is not asian, it's Japanese only pretty much. Well, probably not, but Tsaesci stuff is - and that's what we get to see on Tamriel. I originally had a long post about semantics and history of China, Korea, Mongolia, Japan, etc and its parallels to the continent of Akavir, but felt that it detracted from this thread and its purpose. Since there isn't a delete button, I'm just removing my long lore post, since this isn't the place for those conversations. And to get this thread back on track, this looks great and I can't wait to see the other Ordinator armors you cook up! I think that the yellowy colour is too dark personally but it looks great. 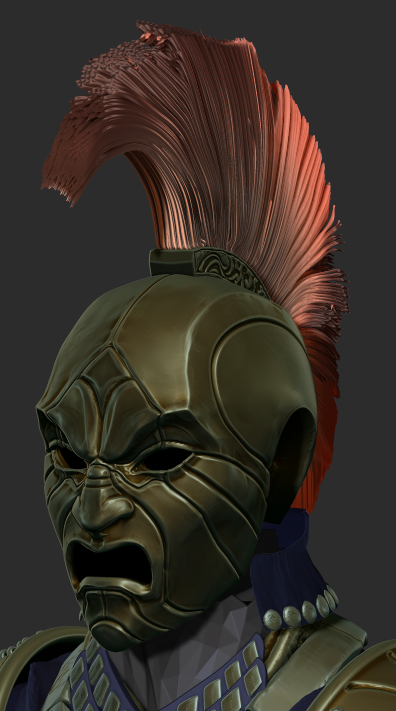 Modeling here is very high quality and I like the detail work in the mask. However, I agree that the mouth expression definitely changes the impression from a stoic guardian of the tribunal to a much more threatening warrior figure. This is not the look we should be going for. The original calm look of the ordinator mask seems more fitting. Maybe a snarling nose and threatening eyes with calm mouth of the original could work? This would present a more ambiguous expression of capable, controlled guardian rather than a mask displaying intense rage uncharacteristic of an ordinator. The pictured samuri mask should not be used as reference or resemble the ordinator mask, because it's esthetic purpose was to inspire terror, not trust and respect. 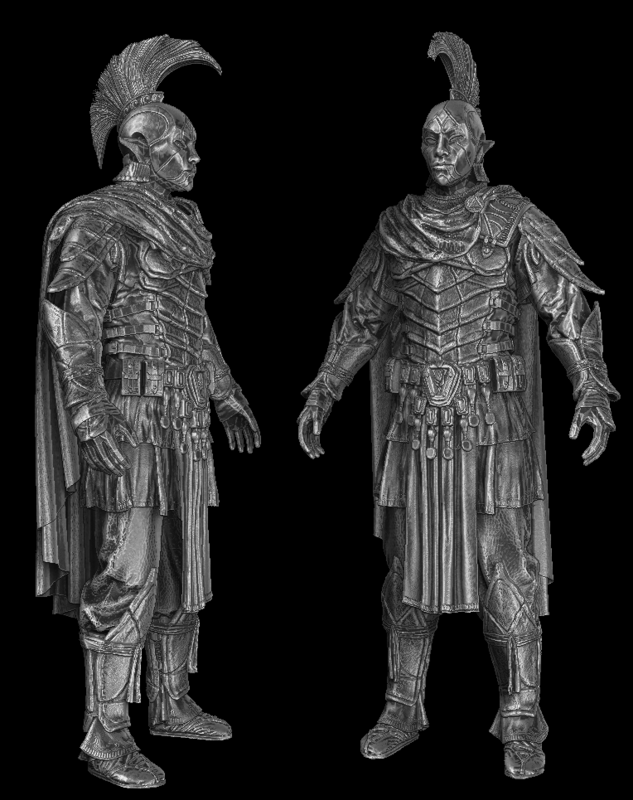 @Smerk & Sasquatch: That is only one of the Ordinator armor sets. Dragomir made concepts for 4, each being for a different Order. Yeah, each face has a different expression. I think it's quite fitting! Where will the other 3 fit in though? Only the Watch Ordinators featured in Morrowind. The Order of the Watch will be the most numerous and of course the default for Morrowind replacements, patrolling the city of Vivec. The Doctrine will be walking the libraries around High Fane, there will be not more than a few. All Indoril with highest ranks will wear that set too. Some of them will also be employed as preachers in the Ministry of truth (the capitain in there will be in the Doctrine Order as well). The Inquisition will walk the roads and towns (in the assist of the Watchmen) to do investigations and look for heretics - and from time to time condemn them (executions should perhaps be done by the order of War). The order of War will be stationed at Ghostgate, and they'll be found patrolling the wilds near Daedric shrines and Sixth House bases, as well as in Ald Daedroth (the ordinators in there already had a distinct look in Morrowind). They'll take the fight to Daedra worshippers and Sixth House cultists, as described in their lore. Damn it guys, you really thought I've made all these variations without first thinking where would they be put in game? Hhahaa, this sounds good. I'm really psyched about having these variations in game! The concept is real quality too. Next time look up the designs and read their descriptions before writing feedback. All of this is extremely impressive. I particularly like the tousling of the helmet hawk - really gives a unique feel to it, for sure. OH, it hadn't even occurred to me that four unique versions would be made when there was only one in vanilla Morrowind. or that the first to be made would be used so sparingly, considering the majority of the tile sets haven't been completed and some not started. priorities and such. Can I just say that this looks badass (am I allowed to say that? I'm not sure what counts as "over the top" in swearing)? The color scheme is perfect, the model is fantastic... I can't really find a single thing wrong with it. I can't wait to see the other three orders, especially the Order of Doctrine. Especially can't wait to wear them in-game. This guy reminds me of the giant armored guy in 47 Ronin. I'll try to make the hawk look wilder. These are gonna be awesome, really can't wait to see the Inquisition armor! IT'S ALIVE! By the Gods, this is absolute beauty. This, and our Vivec will give people nose bleeding because of the amount of awesomeness. That is some beautiful sculpting! Loving the subtle change in the mask between the Watch and Doctrine. In fact, I don't know what I'm not loving about all of this. This is quite full of perfection. Nay-sayers Heretics will be locked in the Ministry of Truth. 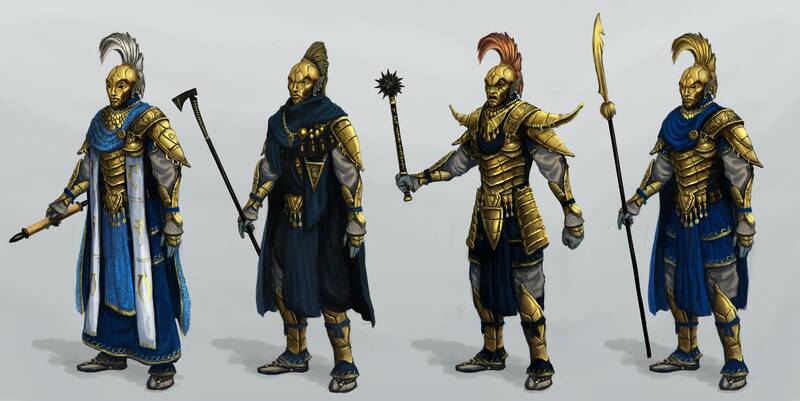 I would like the gold to be brighter from the concept art. I'd echo that thought for the Order of Doctrine specifically. Their ornaments should be a lot more ceremonial than the worn and tested Order of Watch & War. 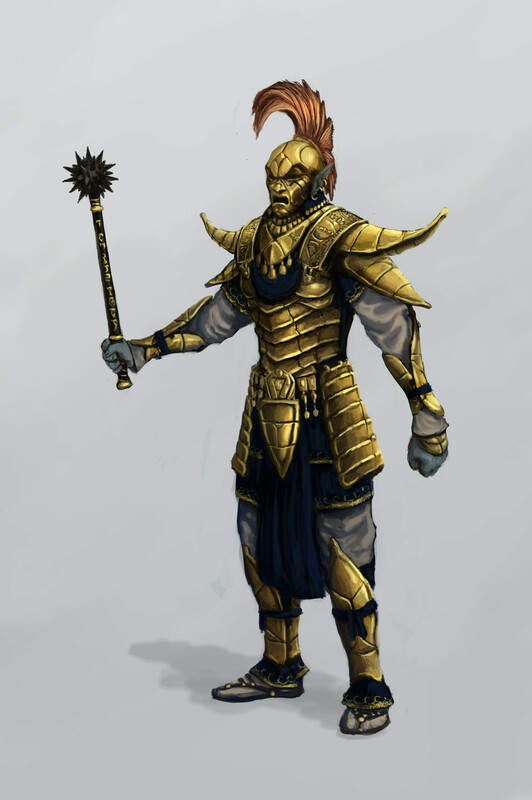 The gold of that set should look a bit more polished and maintained to represent the position of these Ordinators. the best armor so far, absolutely gorgeous! Can't wait to see that ingame! Any news on that fourth set? Hahaha how did I miss this when I came back!? . . . This is awesome! Great job!